First I was suspecting a software issue, but googling turned out fruitless. 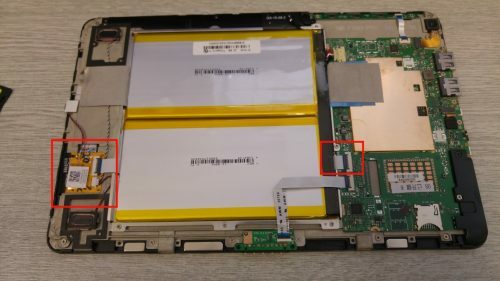 Just before I was about to order a new touch screen replacement for the tablet, I decided to disassemble the device to check the internals and make sure I order the correct part. There are probably 3 different version of Linx 10 tablet released and I didn’t want to end up with a wrong part. Removal of the back cover was very easy as it is held by clips around the edges. Once I got inside I was pleasantly surprised by the sturdiness of the construction. Even though the tablet is rather cheap the internals are securely attached to a metal frame. 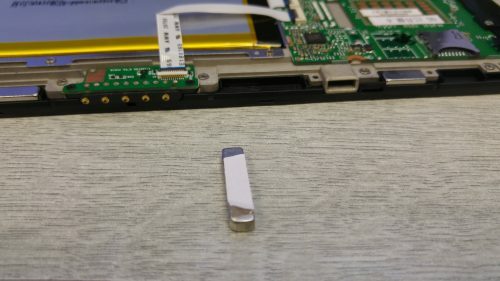 No wonder the tablet feels heavy. 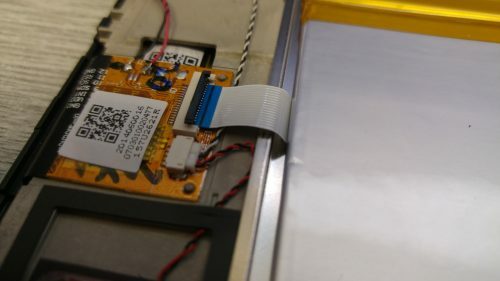 I determined 2 connectors which link with a flexible ribbon cable the touch screen and speakers to the main board. The ribbon cable goes underneath one of the batteries. Just out of curiosity I decided to unclip the connectors and inspect the ribbon cable. Both sides of the connector looked intact and OK. I plugged the ribbon cable back on both ends and secured the connectors. I decided to give it another test to see if there was any change in touchscreen performance and… presto! It was working perfectly fine! Reassembly was very easy – just had to apply double sided sticky tape on one of the internal magnets for the docking station which got loose and put it back in place. This Linx 10 is back in action with an easy fix and a useful lesson learned: always try to wiggle wires and check connectors first, before carrying on with a repair!